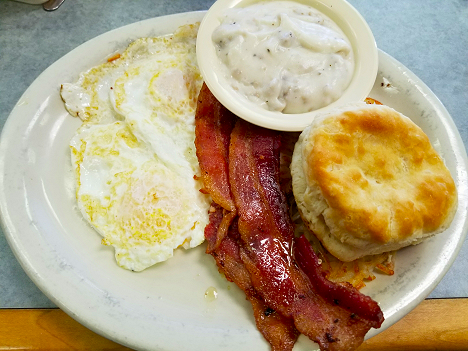 Our visit up to Kingsland this past weekend gave us a plethora of good country eating, and of course, we had to do our part in checking this out for our readers. 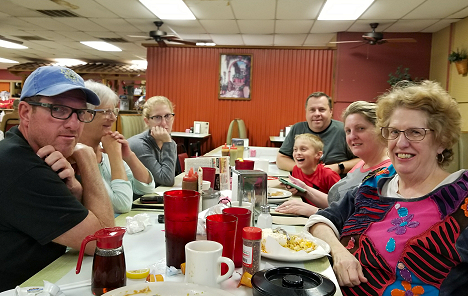 We started off with a Friday night get-together at a local diner called Crazy Gal’s. Actually there’s 3 of them in the area, and it’s easy to see why they’re so popular. This is just good ole Texas country cooking. 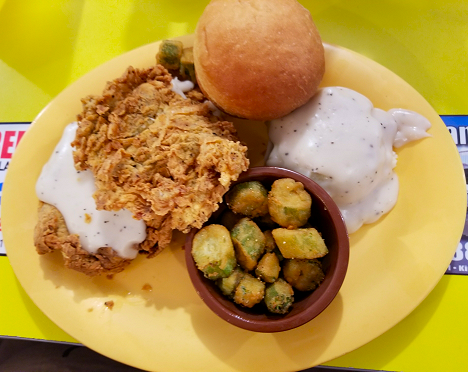 Jan had the Chicken Fried Chicken with Mashed Potatoes and Fried Okra. She said it was really tender, and bigger than it looks due to the fact it’s folded over so it will fit on the plate. 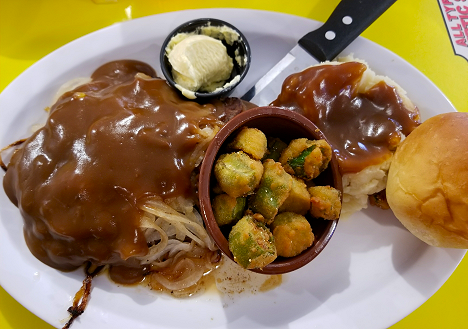 Buried under this pile of tasty gravy and onions is a delicious 8oz Hamburger Steak, along with the obligatory Mashed Potatoes and Fried Okra. The next morning had us having breakfast at The Dam Grill, sans Brandi, Lowell, and Landon, due to Landon having some allergy problems overnight. 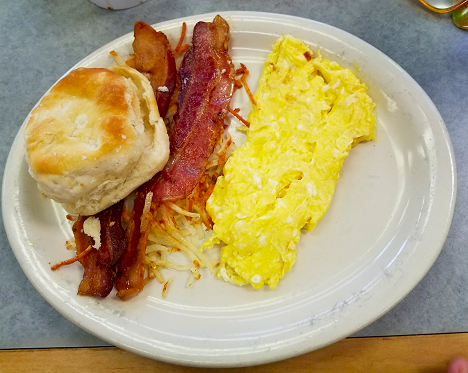 while I got my usual Eggs Over Medium, Bacon, Hash Browns, and the above fantastic biscuit. Is this a happy, well-fed group, or what? But of all our good food, Saturday’s dinner was a real find. 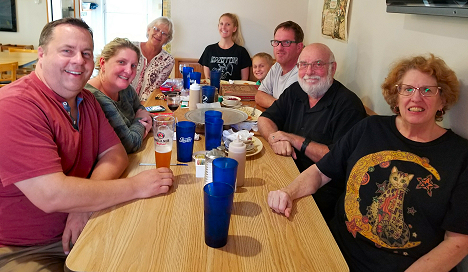 The Kempner Brick Oven, in the tiny town of Kempner, TX, population 1097, is a German restaurant that rivals any we’ve ever eaten at, including the fabled Der Linderbaum in Fredericksburg, TX. Our daughter-in-law, Linda’s mother was born in Germany, so Linda grew up knowing what good German cooking is like. 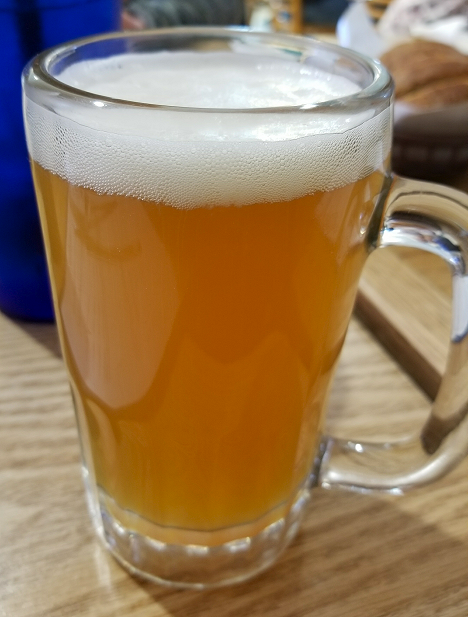 When I saw the Hefeweizen beer that Lowell ordered, I decided to have one too. A very light, smooth Wheat Beer, and really good. 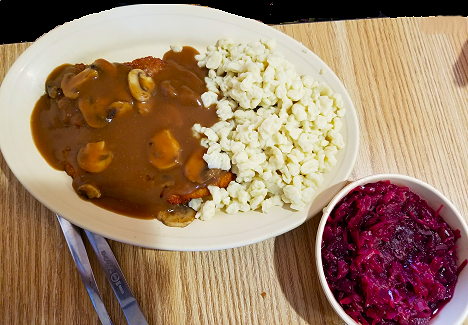 Jan got her usual German fare, the Jaeger Schnitzel, which is a basic Schnitzel covered with Mushroom Gravy, along with Spatzle, and of course, Red Cabbage. 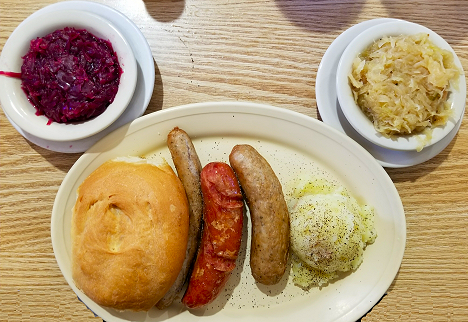 I got the Sausage Plate, with Thuringer, White Bratwurst, & Nurnberger sausages, along with Sauerkraut & Potato Salad. And of course, Red Cabbage. What makes this place even better is that it’s about half the price of our other favorite German places. Delicious and Cheap! 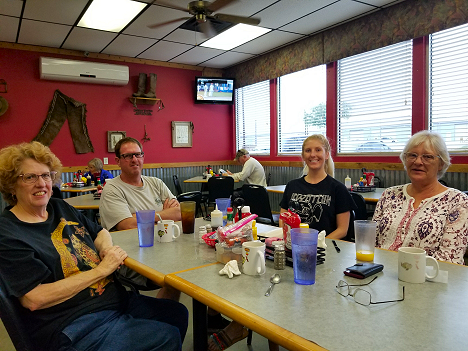 Sunday morning was our last get-together for the entire family, since Brandi, et al., were heading back to Houston right after our breakfast at El Bracero, a local Mexican place. 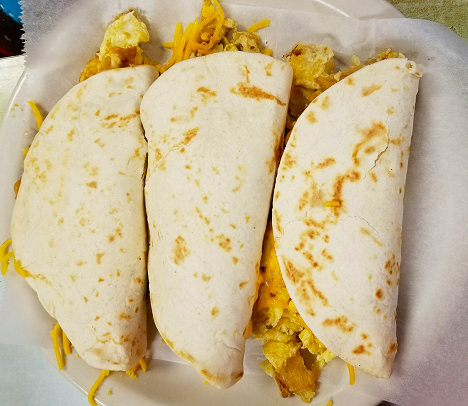 Jan got the 3 Breakfast Taco plate, with one each Sausage & Egg, Potato & Egg, and Bean & Cheese. Jan said they were really good, and she had leftovers for supper after we got home. 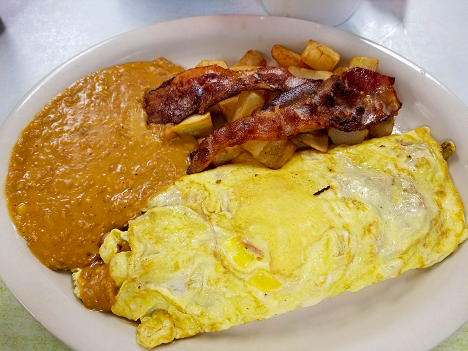 I had a really good, little bit of everything, Spicy Omelet, along with Bacon, Refried Beans, and Ranch Potatoes. Really good, and very spicy. By the time Sunday dinner time rolled around, Jan and I were the only ones left, so we wrapped up our last meal with Chris and Linda at another local favoite Mexican restaurante, Tequila Jalisco. 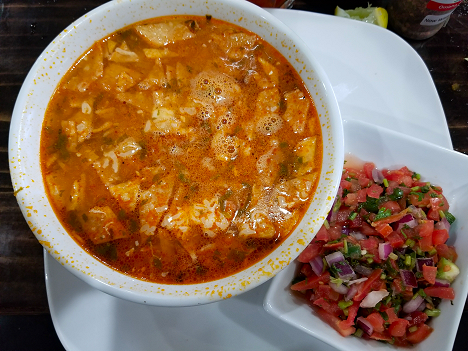 while I went with their Chicken Tortilla Soup, both really great. 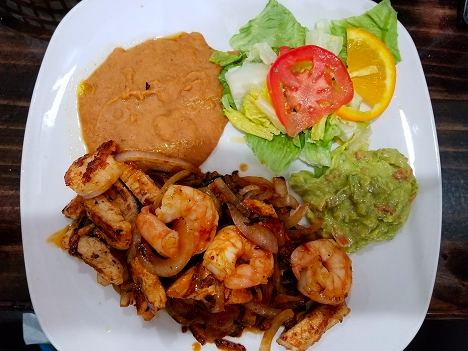 It seems like no matter where we all go, we always find great places to eat. Too many of them, it seems. One thing kind of different about the Kingsland area is that many/most restaurants don’t take credit cards. Instead they have an ATM right by the counter. And they’re all the same type of machine. And several of the business rebate the $2 ATM charge, saying it’s cheaper to do it that way than to pay the credit card fees. Tomorrow we’ve got some phone calls to make, ordering our rides to and from the airport, calling the PO to hold our mail, and calling our banks to let them know about strange charges coming from Europe next month.